Have you been making New Years resolutions? I am not the best at making resolutions, my usual goal is just to get through the next year in one piece with a conscious effort to live it in gratitude and creativity. 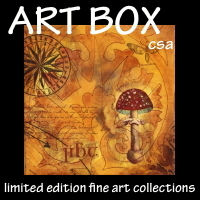 That includes making art myself and helping others make art by sharing the skills and techniques that I know. 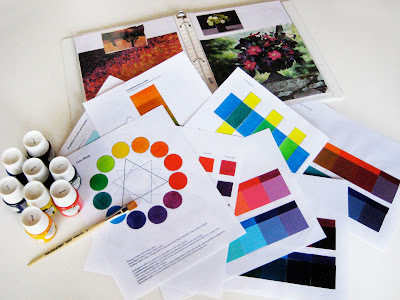 If you want to start your year off with a boost in your understanding of color and how to make it work for you, take my online Color Theory Class. I am going to start the next session January 12th. It is a 9 week class for $60, you can read more about it here. Here's Abby taking a short break from keeping herself warm in someone's shirt and posing for her Christmas portrait. 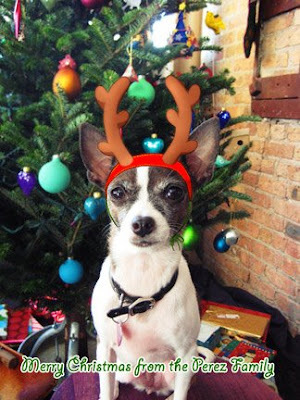 Actually Nina added the antlers in Photoshop, Abby is not real fond of wearing any kind of clothes. Doesn't she make a cute little reindeer? I hope you all have a wonderful holiday, thanks for visiting me through the year. Last night the wind literally shrieked all night as it blew across the city and over our roof, following several inches of snow from earlier in the evening. We woke up this morning to -6°F with wind chills of -30°F!!!!!! and it did not warm up more than 3 degrees all day. Why is wind noisier the colder it is? 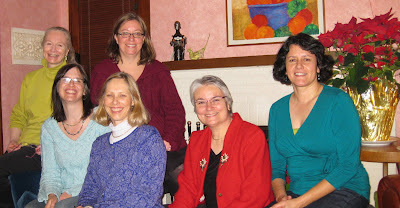 Sunday was the annual Chicago School of Fusing Christmas lunch with Jane Sassaman, me, Frieda Anderson, Emily Parson, Laura Wasilowski and Anne Lullie. 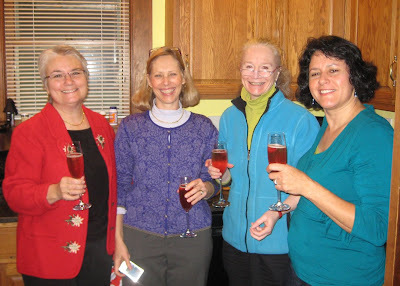 Frieda brought Champagne and cranberry juice for Poinsettias, yumm! 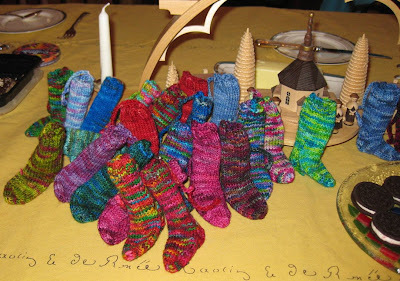 Emily brought out her 25 little knit socks for an advent calendar she is making. 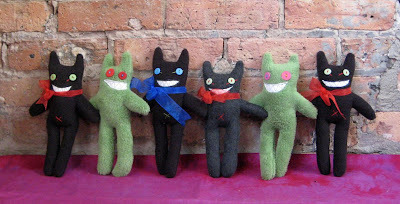 They were so cute, every one wanted to play with them and ooh and ahh over all the lovely yarn colors. 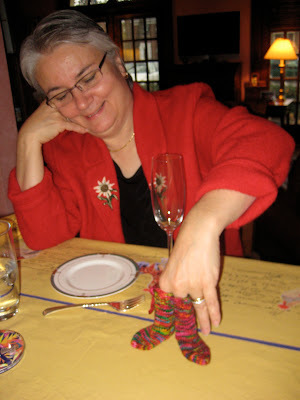 Emily knit these with leftovers from her Sophies Toes hand dyed sock yarn. 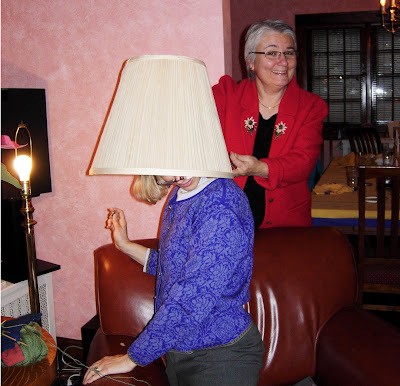 There is always too much fun with these gals, lots of talk, laughs and wearing an occasional lampshade before the day is over. 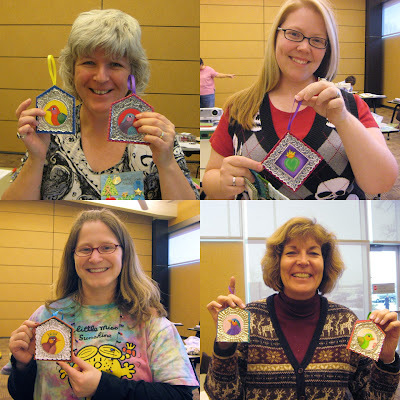 This week I gave a lecture and taught a workshop making Fiesta Ornaments at the Riverwalk Quilters Guild. The weather was lousy but the spirits were high. 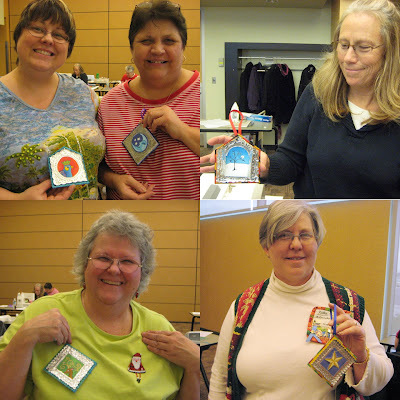 A wonderful adventurous group willing to move out of their comfort zone painting and sewing metal. 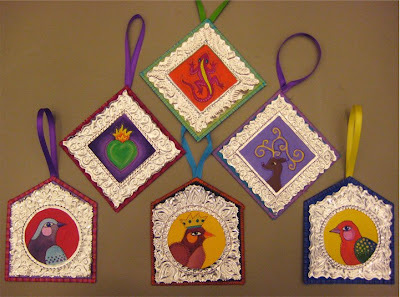 Beautiful ornaments were made by all. 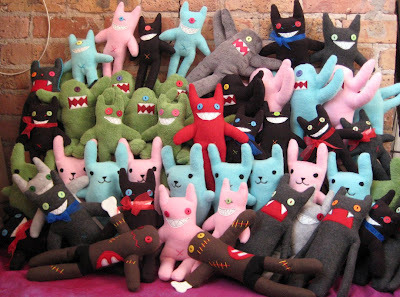 My daughter Nina had a big order to make 50 of her Happy Monsters for Christmas. 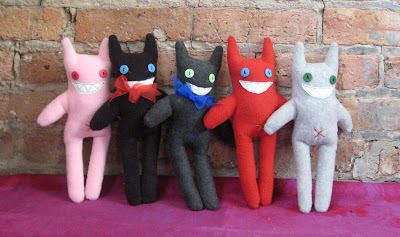 She has been sewing like a fiend, but has finished her order and sent them off to their new homes. 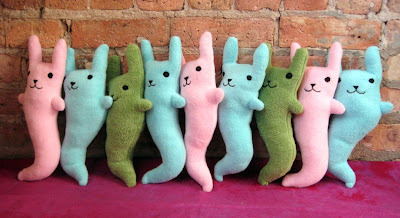 They vary in size from 10-14 inches and are made from polar fleece and super soft fur. I want a couple for myself. Aren't they cute? 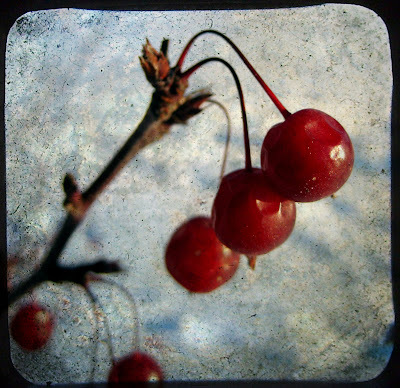 On Friday, I picked up Laura Wasilowski and Frieda Anderson at the train station and we drove over to the One of a Kind show at the Merchandise Mart in downtown Chicago. It has sort of become tradition since I have lived in Chicago. It is so much fun lunching, chatting and looking at all the art. 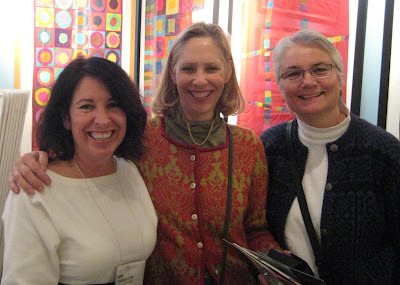 We always enjoy seeing fiber artists at the show and spend extra time admiring their work. 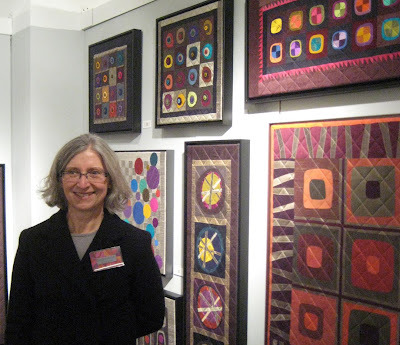 Susan Hedin, from Minnesota, quilts saturated jewel tone and neutral colored silks in a contemporary geometric style. You must go to her website to see her work in all its glorious color. 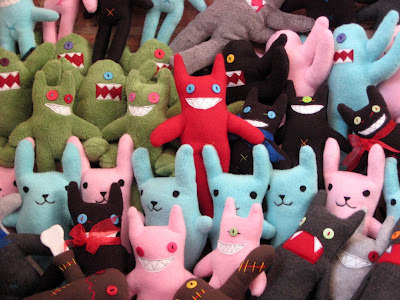 Mimi Damrauer has a booth at the One of a Kind show each year. 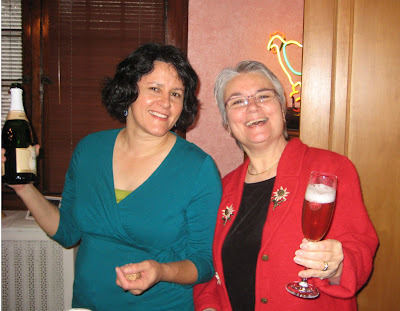 Frieda and Laura have been friends with her for years. 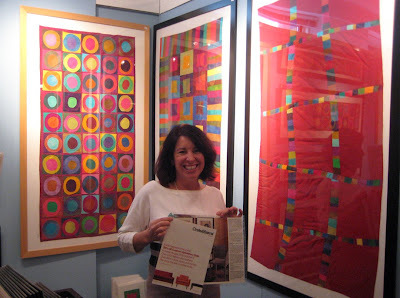 Mimi's sister, Marcia Derse is also a talented textile artist and often has a booth in the IQF shows. Mimi posing in her beautiful booth with a Crate and Barrel ad featuring a rug she designed for them. 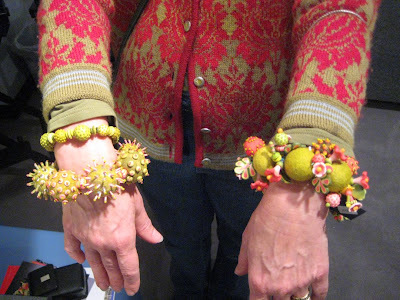 Debra DeWolff from Wisconsin makes beautiful whimsical jewelry combining felt balls with polymer clay. Frieda had to try on several in her color palette. Look how color coordinated Debra and Freida are. 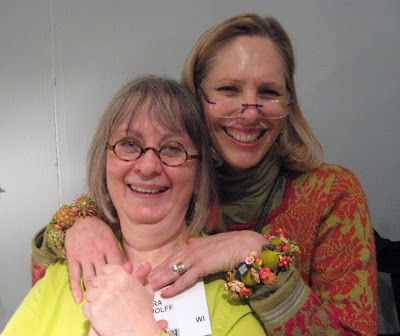 Some how we managed to miss Susan Hinckley's booth, the show was really big this year. I saw this piece hanging in a display as we were heading out. I love her work and am so happy to see she now has an internet presence. 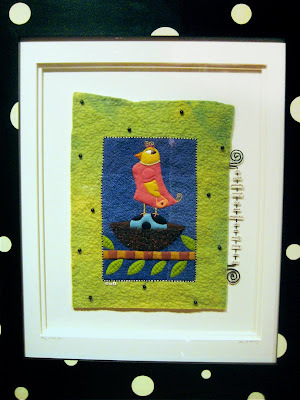 Susan's work is humorous and beautifully made with felted wool and embroidery, incorporating messages with words cut from paper. 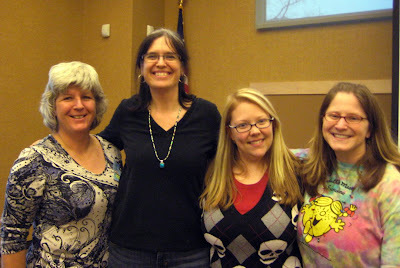 Susan also has a blog now. 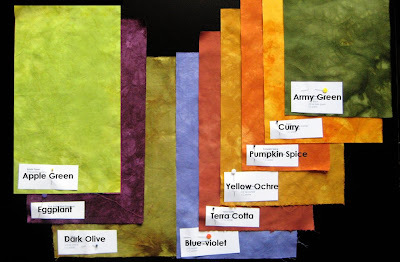 When I was working on the project for RIT, I experimented with creating some of my favorite jewel tone colors. I found that I could create a really nice range of bright and earthy colors. These are some of my favorite color combinations. The wonderful thing about low immersion dyeing is getting the range of values and sometimes little bursts of contrasting colors that can pop up when the different color dye molecules haven't fully mixed. I love that dark olive color. 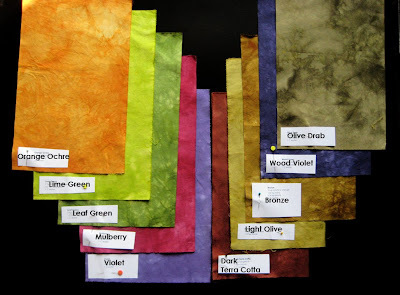 If you would like the recipes for any or all of these colors you can find them over at my other blog Painted Threads Projects.